Our technology is bases on the application of enzyme libraries to produce nucleic acid derivatives. Enzymes originate from mesophilic or extremophilic (working at extreme conditions) organisms. They act as biocatalysts in synthesis reactions and allow for the production of nucleic acid derivatives in few steps and with high purity. Using the long term scientific expertise of more than 10 years we are able to produce nucleic acid derivatives like modified pentofuranose-1-phosphates, nucleosides or nucleotides with high efficiency. BioNukleo´s technology leads to reduced production costs and low environmental burden. 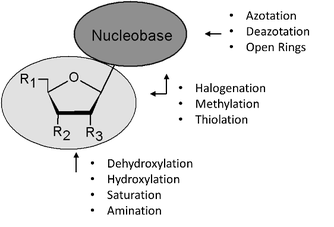 Using our enzyme libraries we are ably to produce a wide variety of modified nucleosides. 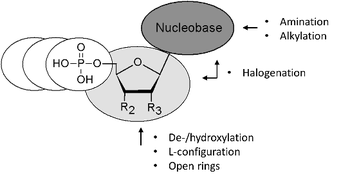 Modifications at the nucleobase and the sugar moiety are well tolerated by our enzymes. BioNukleo uses nucleoside kinases for the production of modified nucleoside mono-, di- and triphosphates. NTP analogs can produced in a one-pot cascade reaction with high efficiency and purity. 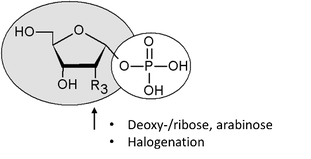 Recently, pentofuranose-1-phosphates were coming to the focus as precursors for the enzymatic synthesis of nucleoside analogs. 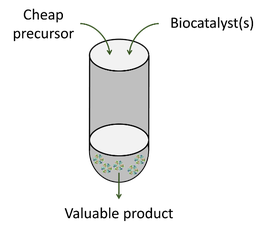 Using this technology much higher product yields were reported. Using our enzyme libraries we are able to produce modified sugar-1-phosphates with high efficiency and purity.